It’s been decades since lipstick has been the most popular form of makeup. It indeed is one of the most essential fashion accessories that most women just can’t do without. I’m sure you ladies will agree that it’s the “go-to” makeup for a lot of us when we quickly want to pull our look together. As the popular saying goes – “Give a woman the right lipstick and she can conquer the world”. But having said that, let me tell you that not everybody knows how to apply lipstick properly. It’s an art. 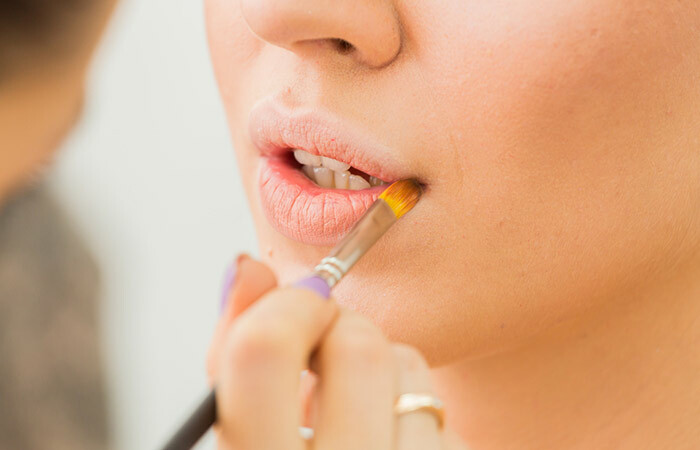 If you are one of those struggling to master the art of applying lip color, here’s help. 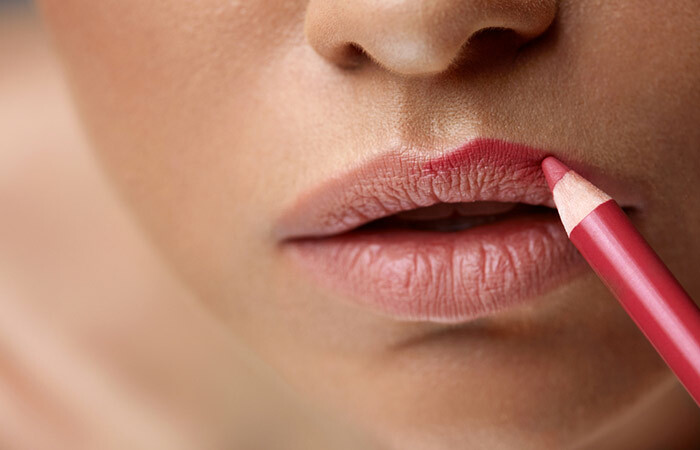 We have a few hacks for you to apply lipstick perfectly if you ever found it fading as soon as you applied it or cringed when you found it bleeding on the outside of your mouth and onto your teeth. Sounds familiar? 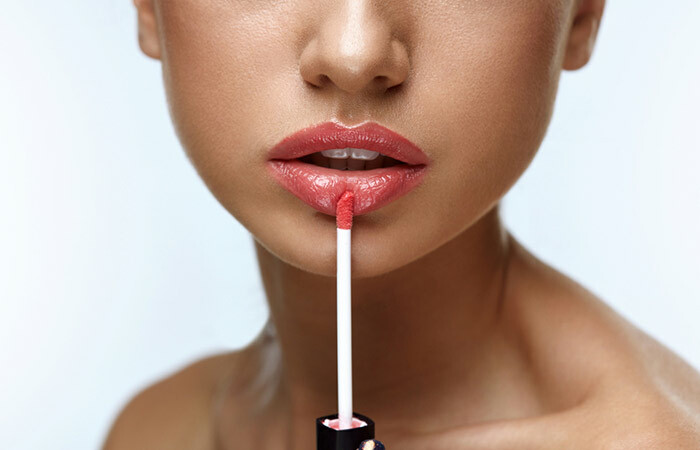 Let us help you out with these simple ways to apply lipstick perfectly! To achieve the perfect pout and to make sure it stays, remember to follow these easy tutorials and tips for that glam look that lasts all day. And now we dive straight into the tutorial. This is the first and foremost step and I can’t stress upon this enough – prepping is key! You don’t want to be walking around with dry, chapped lips. Exfoliate with a soft, damp toothbrush and hydrated by applying a nourishing lip balm to make those lips soft, supple and healthy-looking. You may apply a lip primer after to make the color stay on longer and to prevent it from bleeding. If you are worried about any kind of discoloration or an uneven liptone, it’s crucial for your lipstick to have a base to hang onto. This is to make sure your lipstick does not sink into your lips. Choose a concealer shade that matches your lip color and dab a little on with a flat brush or a small fluffy brush. Apply some compact over this to seal the base. It also helps your lip color to stay on longer. Note: The M.A.C Prep + Prime Base is a great option and is also recommended by professional makeup artists. To define your natural lip line and to prevent your lipstick from getting messy, use a good lip liner to define, reshape and perfect the contours of the lips. This way you will achieve a more defined, precise and polished look. Trace over your natural lip line from one corner to another with a liner that compliments your skin tone to prevent feathering (this sometimes depends on matching it with the lipstick you decide to wear). To make the cupid’s bow more prominent, create an ‘X’ shape on your upper lip, just below the cupid’s bow. Don’t worry if the lines on the inside are slightly imperfect because the lipstick will cover them anyway – but it’s the outer lines that matter. Note: Use a liner that has a moderately smooth texture for easier application. I really like the Lakme 9 to 5 Lip Liners that come in various beautiful shades. Once you finish all the above steps and choose your lipstick, take some product onto a lip brush and apply it evenly all over your lips. Don’t miss out the inner corners. Ensure you apply it within the corners of your lined lips. Go coat by coat and intensify the color as you please. Usually, one good coat of a quality lipstick will suffice. Note: If you have dry lips, you may not want to use matte lipsticks since they tend to dry your lips even more. Look for moisturizing lipsticks that also condition your lips. If your lips are on the thinner side, avoid using very dark colors as they tend to make your lips look smaller. Use a small concealer blush and work on your edges to correct the shape of your lips. This is optional but if you want to give your lips that pouty look, you can add a subtle hint of lip gloss. Now that you’ve got a basic idea of prepping your lips and applying lipstick perfectly, let’s cover a few other essential ideas that you can make use of. In case you don’t have a lip liner in your makeup box, don’t fret because there exists a secret to applying lipstick perfectly, without using a liner. Rub your ring finger into the lip color of your choice and press this finger directly onto your lips moving along the natural lip line. This way you achieve precision without a liner. For the interiors of your lips, finish off by applying the color either directly from your lipstick tube or using a lip brush. Wasn’t that simple? This trick also comes handy when you are in a rush! 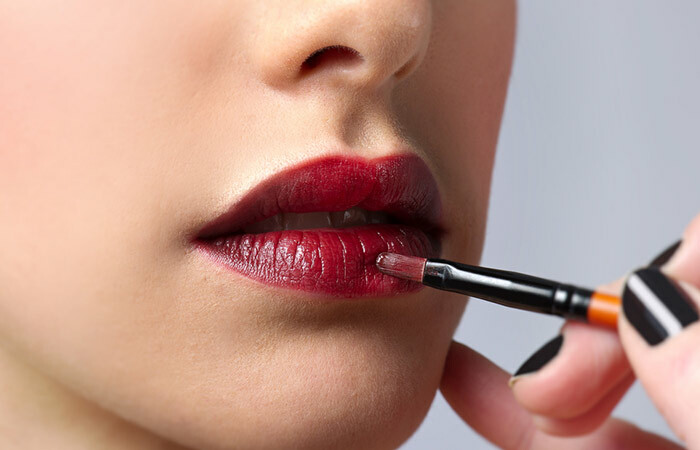 Let’s look at some other simple tricks to help you achieve lipstick that is so on point. If you have dark, pigmented or discolored lips, with a few simple hacks, you can still conquer your lip color. Do not shy away from light colors or sheer pinks because these tricks do work if you just put in some effort. The key here is to neutralize pigmented lips using a concealer that exactly matches your skin tone. Where there’s darkness, there’s always concealer, so it’s not odd to use one for your lips. You will be amazed at the difference it makes. If a little concealer wasn’t of much help, you can dot a little more of the product onto your lips till you achieve your desired effect. Use a lip liner that goes with the lipstick color and carefully line your natural lip line making a cross or an ‘X’ right under the cupid’s bow to enhance the shape of your lips. Apply your lipstick in layers if required. Use a non-glossy formula for better results. Also, those have a much greater staying power than creamy or glossy lipsticks. Now you can wear any color that you wish to! That’s not all, we have a few other hacks for the beauties whose lips are on the smaller side. 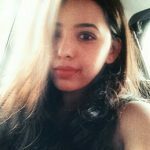 If you are someone who wants to achieve a fuller look with the help of a little lipstick, read on. There are so many cool makeup shortcuts that can grant your wishes. Note: There are also products in the market for lip enhancing and pouting such as lip plumpers that temporarily give your lips a fuller appearance. You could use a nourishing lip scrub or a natural sugar scrub for exfoliation. Gently massage the scrub onto your lips in slow circular motions. Use a primer for an even base and to increase the longevity of your lipstick. Use a lip liner that matches your lipstick color. Refrain from using very dark colors as this will only make your lips appear even smaller. Once you’ve applied your lipstick, make sure you highlight. Just like what highlighting does to your face by creating dimensions, highlighting makes your lips appear fuller. For an added touch, use some lip gloss over your lip color. A lip gloss is a godsend for small or thin lips. 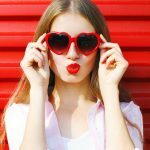 These are a few extra tips and tricks that you can keep in mind if you are a lipstick enthusiast. Never use a dark liner with a light shade of lipstick – it will ruin your entire look. Always soften the lines formed by the lip liner by blending them out properly either by using your fingertips or a Q-tip. Get to understand your lips and also what formulations work best for you as this differs from person to person. Always blot using a tissue to remove excess product and even out the texture. To turn a glossy lip color into a matte finish, dust on some translucent loose powder on the lips and let it rest for few seconds. Dab them with a flat or a fluffy brush to even the powder out. When applying lipstick with a brush, use an angular brush. This helps in providing a more defined look. If you wish to follow the pastel lip trend and do not want to shell out any more money on buying them, you can make your own pastel color (DIY). Use a white pencil all over the lips and pat any of your favorite lip colors onto the lips. There you go! To achieve plumper looking lips, apply some cream-based highlighter onto the Cupid’s bow. Always ensure that you have no lipstick marks on your teeth as this tends to happen when you wear a creamy, transferable lipstick. Never use expired lip products as these can cause allergic reactions and other health issues. Avoid trying out tester lipsticks at stores as it’s been on many lips and it can be a cause for the spread of infections. Never apply lipstick on chapped lips, it will only accentuate all your cracks and lines. Now that we’ve covered application let’s talk about how to remove your lipstick at the end of the day. It’s so important to take off every speck of makeup before you go to sleep to maintain the wellness of your skin. Besides, it feels good to have soft and healthy lips, doesn’t it? There are several ways to remove lipstick. Ideally, you can use a makeup remover that you will find in abundance in the market. I personally prefer Neutrogena’s Eye and Lip makeup remover as it does the job effectively, yet gently and Neutrogena’s products are very reliable. We must be gentle with our lips, and while removing lipstick, we must always ensure that we don’t damage or dry out our pout in the process. Just dab some petroleum jelly onto your lips just like any lip balm, let it sit for two minutes. Use a wet wipe or a cotton ball to wipe away the lipstick. This also works for your liquid mattes! Slather on some coconut oil onto your lips which is nourishing and also one of the most natural makeup removing agents out there. With the help of a cotton ball, wipe away any product on your lips. If you have nothing else available, you can try using some of your face lotion or body lotion and gently massage it onto your lips. After letting it sit for a couple of minutes, wipe it off with a cotton ball. That’s all there is to master the art of wearing and removing lipstick. 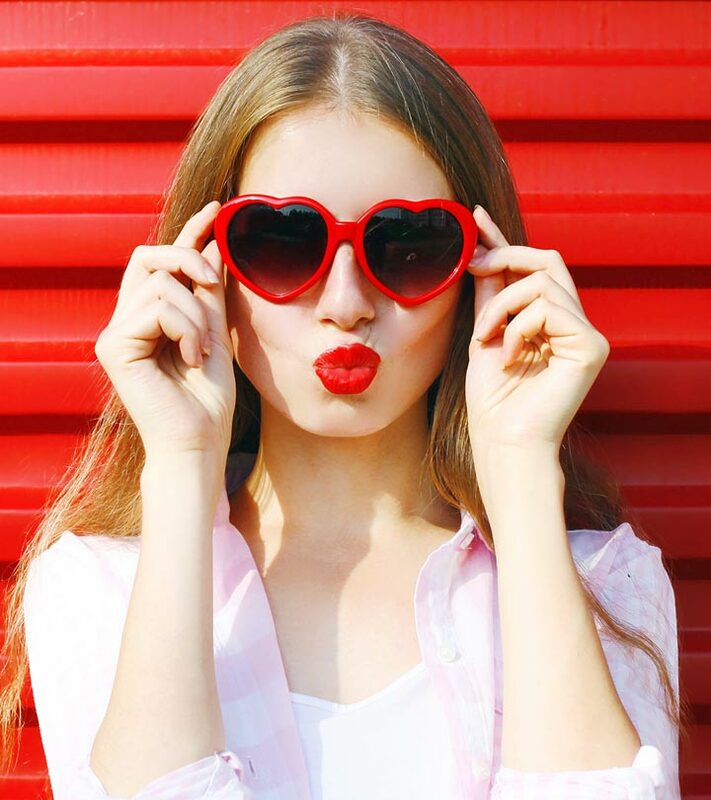 We hope you’ve made mental notes of some of these old tricks and hacks for the next time you want to dress your pout. Give these tips a shot and write to us about your experiences or queries in the comments below.